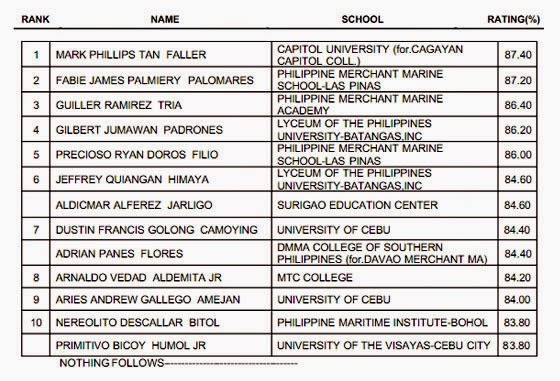 November 2014 Chief Mate Board Exam Results (list of passers, topnotchers, performance of schools) - Balita Boss! The Professional Regulation Commission or the PRC released the Marine Deck Officers November 2014 Chief Mate Licensure Examination results. The official results were released on Tuesday, November 18, 2014. The examination was conducted by the PRC on November 14 and 15, 2014 in the cities of Manila and Cebu. A total of 263 out of 678 examinees passed the November 2014 Chief Mate Board Exam, according to PRC (via PRC Website). View or download the performance of schools in the November 2014 Chief Mate Licensure Examination at prc.gov.ph. CAPITOL UNIVERSITY graduate MARK PHILLIPS TAN FALLER topped the November 2014 Chief Mate Board Exam with a passing rate of 87.40 percent. The Board of Marine Deck Officers who administered the November 2014 Master Chief Mate Exam were Capt. Jaime D. Aquino as Chairman, with members namely Capt. Ireneo U. Delos Santos, Capt. Romeo C. Abuyuan and Capt. Marsolito A. Cruz. Registration for the issuance of Certificate of Registration and Professional Identification Cards will start on November 25, 2014. The date and venue for the oathtaking ceremony of the new successful examinees in the said examination WILL BE ANNOUNCED LATER. In January 2014 Licensure Exam, a total of 266 out of 510 successfully passed the Chief Mate Board Exam. Thank you for reading. Please follow Balita Boss? on Facebook, on Twitter or on Google+ to receive updated information about the Marine Deck Officers Licensure Examination.